This guide will show you how to build a strong account quick and effectively. This is mainly for F2P players, however P2P players can apply the same strategies that I will outline. I'll cover some basic strategies to help you farm Heroes, manage resources (Honor Badges, Shards, Gems, Might, etc) and cover base designs for Here Be Monsters. To put it simply, you want to keep your might low as you farm Legendary Heroes. Afterwards, you want to inflate your might to start doing inscriptions. As a F2P player its very important to get your farmable Heroes as soon as possible. The three main Heroes you should farm for are Thunder God, Immortep and Grizzly Reaper. You can get Thunder God in less than two weeks. The strategy I use to farm him quickly is to rush HBM A and B, farm dungeons, and farm Expeditions. Here Be Monsters is going to be your biggest source of Shards at the start of a new account. So being able to farm it your first day allows you to get Thunder God sooner. HBM A can be farmed Day 1 on a new account. HBM B can be farmed Day 6 or 7. To do this, you have to buy builders first before gem rolling for heroes. You can buy your 3rd builder right from the beginning and buy your 4th builder around Day 3 or 4. Builders are a very good investment as they allow you to build a stronger base quicker and lets you progress faster in Here Be Monsters. Your 5th builder is optional, but most people buy him as they get further into the game. If you don't know how to buy your 3rd builder watch this video. It also covers how to start doing HBM A your first day. People will argue that you should gem roll first. The thing is, you only get 3 gem rolls. A 4th builder would be another 6 gem rolls. Just be patient because you will get a lot of gems from achievements and talent refresh cards. It's better to build a strong foundation than gambling on a few rolls at the start. This way you don't have to deal with the slow progress of 2 builders or making 50 new accounts just for a chance to roll a Pumpkin Duke or Vlad Dracula. Those Heroes are nice, however they aren't needed for quite a while. At first, farming a special 3 shard dungeon might seem pointless because its such a low amount. But, the shards start to add up quickly and it allows you to get your Heroes sooner. Once you've hit the flame requirements for upgrading heroes, use the dungeon refreshes to farm special dungeons. -the first and easiest is the 2 shard dungeon, this can be done with your two starting heroes at level 20. -the 3 shard dungeon is farmable with level 40 heroes. -the 4 shard dungeon is farmable with level 60 heroes. I usually progress to the next one as my Heroes level up. In one of my videos, however, I only farmed the 3 shard dungeon and by Day 14 500 of the 2200 shards for Thunder God came from the 3 shard dungeon. I suggest doing the 4 shard dungeon when you can, I only did the 3 shard because I could just drop my heroes and not have to pay attention. Furthermore, this is something you should get use to because dungeons are a big source of your shards later on, when your trying to 7 - 9/9 a skill. HBM J + Storm Mesa III + 40 shard Dungeon = 10,000+ shards a week. More than half of those from the dungeon. Expeditions are a good source for Honor Badges and Merits. Honor Badges are always needed and the Merits will help you buy items that will let you farm your Heroes sooner. *Talent Refresh Cards are very important as a F2P player. This is a big source of free gems. When you get your Talent refresh quest use your card to complete it to get the 300 gem reward. To effectively farm Expeditions you need to keep your Might low. This is an old strategy used for easy raiding, but we'll also apply it to Expeditions. With low Might you will have a better chance to complete all 10 of the Expeditions. *I would also just not build the extra Mana Mills and Gold Mines since they don't give much resources at level 1 and add clutter to your base, making HBM's run slower. These buildings will be upgraded later, just not while farming Thunder God. Only upgrade troops to open up the Destruction Units. This is so you can do the Donation Quests on your Quest Board. Magic shouldn't be upgraded, since a level 1 Restoration will be sufficient your first two weeks of gameplay. These also will be upgraded later on, just not while farming Thunder God. To sum this all up, your first two weeks should be dedicated to getting Thunder God. You will need to get Shards from every source possible, the bulk of it from Here Be Monsters and the rest from Dungeons and items bought with Merits. This is the second hero you'll farm for. Immortep is essential for your HBM progression. The only reason not to buy him is if you've had good luck and gem rolled Vlad Dracula and Santa Boom. It will take a little longer to buy him since he's more than 3x the cost of Thunder God. But, you should be able to farm him in a little over 2 weeks after getting Thunder God. I use the same strategy for farming Thunder God but with some added details. By the time you start farming for Immortep you'll be doing HBM C. Then as your Heroes gain levels, your Towers get stronger, and you get your Druid (with Druid Card), you'll move on to HBM D. But thats only if you got 4 builders first. Otherwise you might have to wait a little longer for your base to get stronger or your Heroes to be higher levels. Going up in HBM levels will give more shards to help cover the cost of 7500 shards for Immortep. I'll be covering HBM Base Designs and requirements in the HBM section below. Continue to progress to the next farmable special dungeon. - 10 shard dungeon. I've only done this one early on one account that rolled Aries. This is the same, your might should be low. There are some exceptions, however, which I'll cover in the Might Inflation section. While farming for Immortep, Thunder God should be a sufficient level for you to start finding groups for Storm Mesa I. I usually start trying to find groups when Thunder God is level 90. You could start sooner if you have someone to carry you, but I found that level 90 is a sufficient level to find groups easier. In summary, Immortep is farmable in a little over two weeks. Do the highest special dungeon you can, HBM's, Expeditions, and Storm Mesa I. At this point in the game, you should have at least a Druid, Thunder God, and Immortep. Grizzly Reaper should be the next Hero you farm for if you haven't had luck gem rolling rare Legendary Heroes. So, if you didn't have any luck with your Special Legendary Card and haven't gem rolled a rare Legendary yet, farm for Grizzly Reaper using the same strategies. The strategy to keep Might as low as possible used to be the best way to play the game. However, with the addition of Storm Mesa, Lost Realm and Inscriptions, keeping Might too low all the time will now work against you in terms of progression. There are times when you need to inflate your might and times to make it low again. While farming for shard Heroes, low might is the best way to go. So basically don't upgrade magic and troops. Also, don't build unneccasary buildings and don't upgrade buildings that won't be used in HBM. This is so you can farm Expeditions easier to gain as much Merits and Honor Badges as you can. Also, since you will start off with ordinary or elite heroes, raiding will be easier. After you've farmed Immortep or during, it's a good idea to start inflating might. At 10,000 might Lost Realm opens up and you can start doing Inscpritions. Inflating might will make raids and expeditions harder initially, but in the long run it speeds up progression. 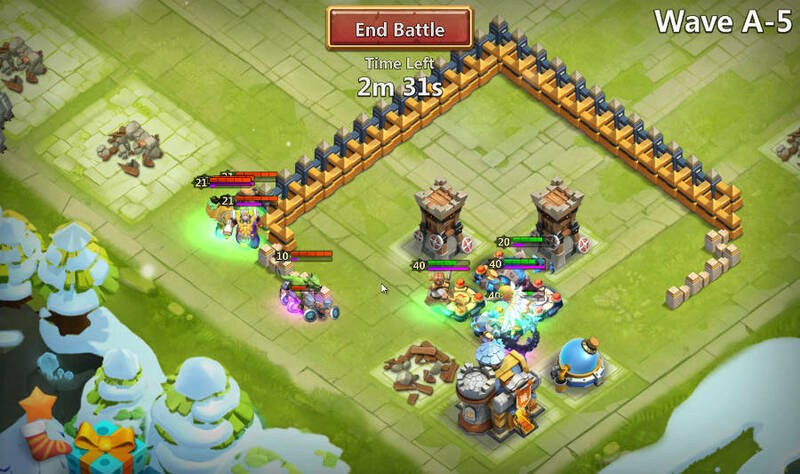 By inscripting Heroes, you can do higher HBM's sooner, as well as, do higher special dungeons. While farming for Immortep I'll usually start upgrading each spell to Level 5. Even though I don't use most of the spells, I upgrade them for the Might. However if there is a priority in upgrading, I would upgrade Restoration, Aries Fervor and Ares Frenzy. The latter two being very helpful in raids to make it go faster. The other spells are more helpful in Dungeons. I'll start upgrading each type of troop to open up the second Tier. Then work on opening up the 3rd Tier. This will add a lot of might and make Donation Quests easier. Personally I've never used troops while raiding or doing dungeons except at the very start of an account when I'm using Ordinary and Elite Heroes. While working up to 10,000 might, upgrading magic and troops alone will be slow. So leveling Elites and unused Legendaries helps make it quicker. You should be saving Experience Tomes and Honor Badges so that you will be able to do this. Only take Elites and Legendaries up to level 60 until you reach 10,000 might. Legendary heroes give you the most Might, so don't consume unused ones. Save some of the elite Heroes you gem rolled for might inflation -save the ones that roll a high number talent, 3/5+, as each level gives 20 might. Finally, you should only inflate might if you have 4 quality Legendary Heroes at minimum. Otherwise everything will be harder, I've found 4 to be a good number if you wanted to start inscriptions earlier. So once you've reached 10,000 might, you will start inscriptin heroes. As your heroes gain inscription levels, your might will go up even higher. So, if raiding or expeditions become too difficult you can always lower your might again to be around 10,000. To do this, just consume the Elite Heroes you leveled earlier to inflate your might. However, once your Heroes are inscripted raids should be easier, but expeditions will still be a little harder initially. It is important to manage your resources. Honor Badges are the bottleneck in this game so spending them wisely is crucial. You should only spend Honor Badges on quality heroes. Don't spend them leveling up common Legendaries past level 80 or Elites and Ordinaries past level 60. - Can quickly level up a rare Legendary Hero once you've rolled one, or level up your brand new shard Hero. - Save all the purple slimes for your quality Heroes. Since Honor Badges are the bottleneck, selecting which Heroes to level becomes important. Initially at the start of a new account, you must choose Ordinary or Elite Heroes, then as you progress through the game, you need to choose which Legendary Heroes are worth the Honor Badge investment. The only 3 Heroes worth buying are Engineer, Marksman, and Angel. Engineer - He is a must have hero when starting an account. He is the best ordinary for HBM's. Angel - She isn't necessary for HBM, but she is very helpful in Expeditions and dungeons until you get Druid. Frost Witch - If you need to fill a fifth spot for your team, she isn't bad since she does good damage and is ranged. Furthermore, Engineer is the only Hero to take to level 80 if you haven't rolled any Legendary Heroes by then. You can usually buy at least 2 heroes your first day after doing HBM A, but definitely buy Engineer first. There are many good Elite Heroes, however in terms of HBM, only Serpent Queen is useful. Since Executioner is a free Hero, he is also good to use and does excellent damage. The other Elite Heroes have specific uses later on, but at the start of an account Ordinary Heroes are more affordable and useful. Serpent Queen - Best non Legendary Hero for HBM. I wouldn't buy her, but if you rolled her with gems or got her with a blue Hero card, definately use her. She is also a Hero worth leveling up to level 80. Executioner - Good damage and stun for the HBM Dinosaur and also helps a lot in raids and dungeons. He is usually the first Hero I replace when I get a Legendary Hero. Other Elite Heroes - Cyclops, Pain-da, Ice Demon, and Assasin. These Heroes are also good, but only use them if you rolled with gems or Hero Card. Personally, I prefer the Ordinary Heroes over these. The only 3 heroes worth buying for a new account are Thunder God, Immortep, and Grizzly Reaper. The other Heroes have situational uses and would be a waste of shards and Honor Badges at the start of an account. Thunder God - A must have Hero for F2P players. He won't be replaced for a long time and is easily worth 2200 shards. Immortep - Essential for HBM's until he can be replaced by a rare Legendary. Grizzly Reaper - Although GR is very strong. I only reccomend buying him if you haven't filled your 4th or 5th spot for your team. If you've been lucky with gem rolls or your Special Legendary Card you could skip buying him. But thats only if you rolled some quality rare Legendary Heroes. ** Pixie and Death Knight - I don't know where they fit in this Tier system since they are new and I haven't had a chance to play them. Druid - He's pretty much needed everywhere. Pumpkin Duke - Pumpkin duke isn't needed at the start of an account. However, he is pretty much needed later on and probably the only Hero in Tier 1 that is absolutely needed. Whereas, you can get by without the others (except maybe Druid). Cupid - Not as essential as Pumpkin Duke. In fact, if you only have Cupid you might be better off with an AOE hero instead in terms of HBM or until Cupid's skill reaches 7/9+. But, the PD and Cupid combo is very strong. *Moltanica - I think that Moltanica is Tier 1, some might disagree, but I think he's more useful than the Teir 2 heroes so I put him here. His skill doesn't have a limit on targets and is also useful in every game mode for its debuff. A F2P player can get him, but it will take a lot of luck and patience. To get Moltanica you would have to save 2000 gems and wait for the Chest Event. Spend those 200 gems on gem rolls or whatever and you'll get 1 chance to open a Chest. So if your lucky you might get Moltanica. Vlad Dracula - This is a best in slot AOE Hero. I would actaully prefer getting this Hero first than all the others since he is very strong in HBM and in all game modes. Santa Boom - Another excellent hero. He is probably just as good or better than Vlad Dracula in terms of AOE damage plus he slows targets. Orksbane - His skill is like Moltanica but has a limited number of targets. I find him more useful than Tier 3 Heroes, but some might disagree. Aries - Aries is excellent through HBM J. However, he can be subbed out for a Tier 3 Hero as you progress further since HBM starts having more than 5 Heroes at a time each wave. These Heroes are eventually replaced by Tier 1 and 2 Heroes. Although they will still have situational uses in the game. For example, Arena, Boss fights, etc. These Heroes help you progress in certain situations when you don't have Tier 1 or 2 Heroes. - Champion - to stun lock Guild Boss if you can't do Boss 3 without stunlocking. - Succubus - HBM Bosses or Dungeon Bosses for the quick damage if you can't tank without a Moltanica or do enough damage without Pumpkin Duke. - Shaman - Same, if you don't have Moltanica this is a really good option to lower the damage of Bosses. As you fill your 5 or 6 hero roster. Try to select from the Tier system. Example: 5 hero team best in slot would be Druid, Pumpkin Duke, Cupid, Vlad Dracula, and Moltanica. If you don't have Moltanica then go to Tier 2 and put in Santa Boom. If you don't have a Santa Boom then go to Tier 3 and put in Immortep or Thunder God. Of course there are situations where other Heroes might be better, but overall this would be a solid 5 man team. Try to level up heroes using the Tier system, giving preference to the higher Tiers. Of course when you start an account, you probably will only have Shard Heroes. So in this section I'll show you how to choose your heroes from the very beginning and give you an outline of how to replace them, managing your Honor Badges in the best way possible. These Heroes will be Ordinary or Elite and will only be taken up to level 60 (1 or 2 up to level 80). These Heroes are going to help you start doing HBM A - C, farm dungeons, and do raids. They will eventually be replaced by your Shard Legendary Heroes as you get them. When you create an account you get Executioner and an Ordinary Hero Card. So that's two heroes, the third hero will be Gem rolled or bought through the Warehouse (if its an option) or with Shards. After you've farmed HBM A your first day with your 3 Heroes, you will have enough shards to buy quality heroes. The first Hero you should buy is an Engineer. He will serve you up to HBM D - E if needed. Now depending on what you got from your Ordinary Hero card and Gem roll, you might not have to buy or replace Heroes. If you got any of the Ordinary or Elite heroes listed above, than your set. but if not I would replace whatever hero you got with the ones I listed. - If my 3 heroes were Executioner, Triton, and Marauder, I would replace Triton and Marauder as well as buy 2 additional heroes for my starting 5. - So my starting 5 might look like this: Executioner, Engineer, Marksman, Angel, and Frost Witch. You could also wait for your Elite Hero Card on your 7th day through daily rewards and see what you roll. If it's any of the heroes listed above then great, if not buy a quality hero. Its very important that you choose quality heroes that I listed because not all heroes do well in HBM, expecially as you start to hit HBM B and C.
- A general rule would be: the more multiple target hitting heroes the better, and preference given to ranged heroes versus melee. The problem with Melee in HBM B and C is that they run so slow at this level and spend more time chasing the wave versus directly attacking them, like ranged heroes do. In summary, your Starting 5 Heroes will only be used until you start replacing them with Shard Heroes that your farming for. They will farm shards from HBM's and special dungeons. Farm Merits from Expeditions and farm Gold and Mana for upgrades. As you approach HBM C - D and have not rolled any quality Legendary Heroes, then only take Serpent Queen up to level 80. If you have no Serpent Queen then take Engineer up to level 80. These Heroes will replace your Starting 5 Heroes. As you reach Day 14 you should be able to buy Thunder God. He will replace one of your Starting 5 Heroes. After using Experience Tomes and Honor Badges that you should be saving, Thunder God will be in his mid 70's to 80's. Next, you'll get Druid on Day 21. He should replace Angel if you got her or any other Starter. Day 30, you will get a Special Legendary Card. You will have a chance for Pumpkin Duke, Cupid, Vlad Dracula, Aries, Snowzilla, Immortep, and Grizzly Reaper. If you get lucky and get one of them, replace another Starting hero. If its some other Legendary than save it for when you decide to inflate your might or level it up to only 80. Around Day 40 you should be able to buy Immortep. Replace another Starting 5 hero. As you start doing Gem Rolls. If you roll a Tier 1 -2 Hero go ahead and replace a Starter. If you roll a Tier 3 Hero thats good as well since you can save your Shards. At this point, you should have at least Druid, Thunder God and Immortep. If your lucky and gem rolled a Tier 1 - 3 Hero or got one through your Special Legendary Card than thats your 4th and 5th Hero. If you didn't get your 4th and 5th Hero, then start farming for Grizzly Reaper. You only need 4 Legendary Starters to start inflating your Might for Lost Realm and Inscriptions. 4 Heroes is safe because HBM is still farmable with inscriptions as well as being able to raid easily at a higher might. You could also just be safe and wait until you have 5 Legendary Starters before you start doing inscriptions. These Heroes will replace any of your Legendary Starters that aren't Tier 1 - 2. As you progress into the game and have had more gem rolls. You will eventually start replacing your Shard Heroes. It's a good idea to prioritize what building you should be upgrading. Town Hall, Gold Vaults, and Mana Vaults should be your first priority. I usually keep this my first priority until Town Hall 17, then switch to other buildings. After Town Hall 17 I focus on Hero Bases, Towers, and Relic Hall. I usually start working on the 6th Hero base after since 6 heroes isn't needed for a long time, but going for a 6th hero base right after Town Hall 17 isn't a bad idea either. This progression guide is closely connected with the information presented above. It is meant to show you how to farm shards sooner to get your Shard Heroes as well as show you how to use HBM to level your heroes. HBM is a good source for shards but experience for Heroes is just as important. So using garrisons is counter productive and really not needed. Garrisons are probably needed by the time you hit HBM Q+ but you don't need them at all before that. However, since inscriptions have changed the game and higher level heroes aren't as important, using garrisons could be viable. But I would wait until you at least 9 star your core Heroes before starting garrisons. HBM A can be farmed the first day on a new account. You can find the details of how to get there in this video. This Base works with any 3 heroes. Heroes must be level 40 because every wave has a self destruct hero and if your Heroes are under leveled they will lose too much health. Town Hall 6 is a simple corner base. This is an image from a $2 P2P account, thats why there's 4 heroes. F2P will only have 3 heroes day 1. But, if you have a Legendary hero you can 3 man it with this base. Town Hall 7 is a simple corner base with added extensions. 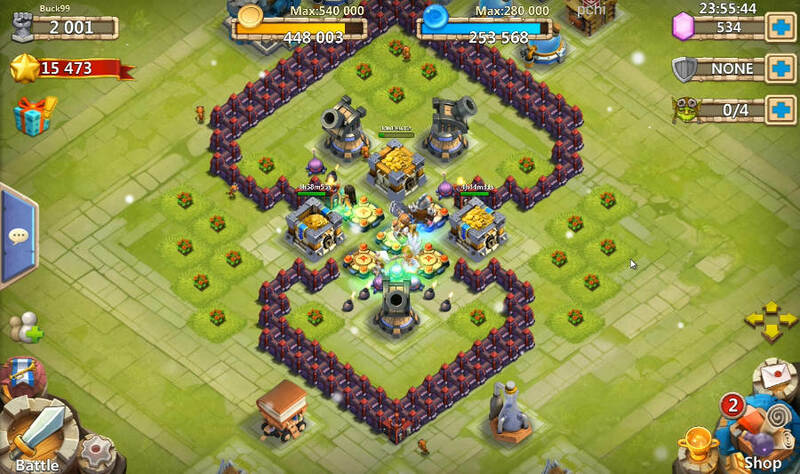 This image is an F2P account I made to demonstrate HBM A on Day 1 found here http://youtu.be/bAXuf1mWAjQ The added extensions make the wave zig zag through buying you 1 - 2 seconds more time to kill the wave, which makes a big difference. The bottom corner is the weak spot of this base. Basically, on your first day, if waves 4 then 5 spawn bottom corner, it will most likely be a failure. By day 2 this becomes less of an issue because your bulidings have become stronger and you should have your Cannon Towers up by then. Also, you've probably added another hero. So, starting Day 2 farming HBM A is 100%, whereas Day 1 its probably 90% success. You can solo or two-man with heroes to quickly level them (once Cannon towers are up). 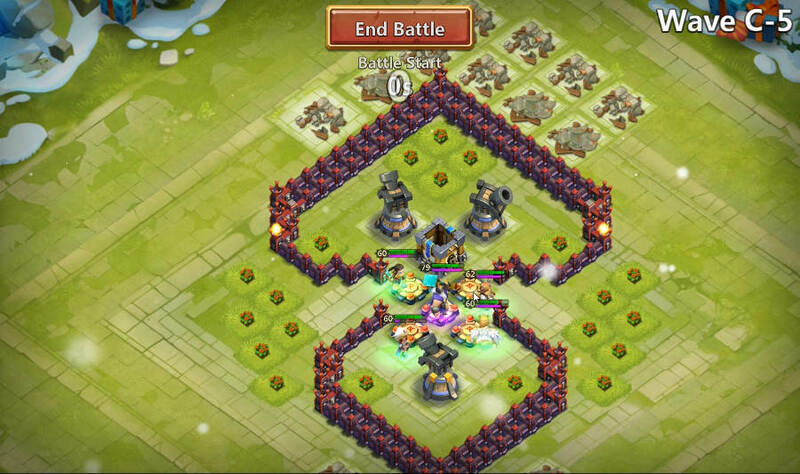 This is a Townhall 10 but at Townhall 8-9 your cannons should be plenty strong. Typically 1 level 60+ (4 star) Hero can solo, or two 40+ (3 star) Heroes, so if certain heroes are capped take them out so that the heroes that aren't capped get all the experience. You'll start to get a feel for how strong your base is and what you can handle. Also, this base protects all your gold very well, so you can fill your vaults up and not worry about losing gold. Just rearrange your vaults and towers. 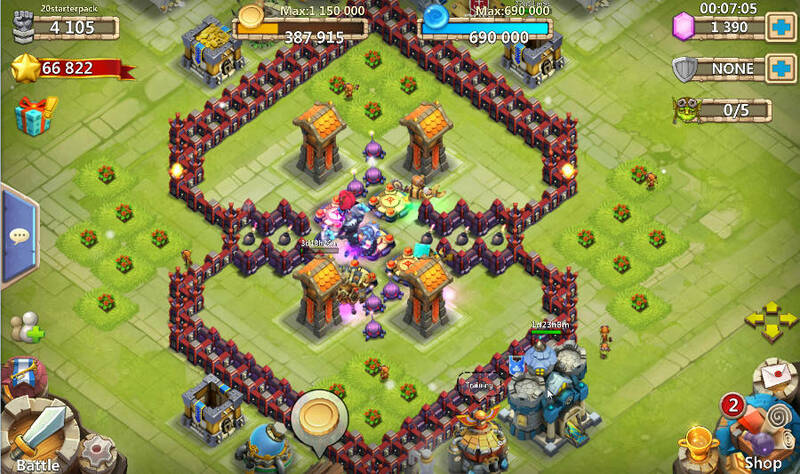 For HBM's B and C Cannon Towers are the best. Arrow Towers work, but your hero's levels will have to be much higher to compensate. The problem with B and C are the amount of ground troops. 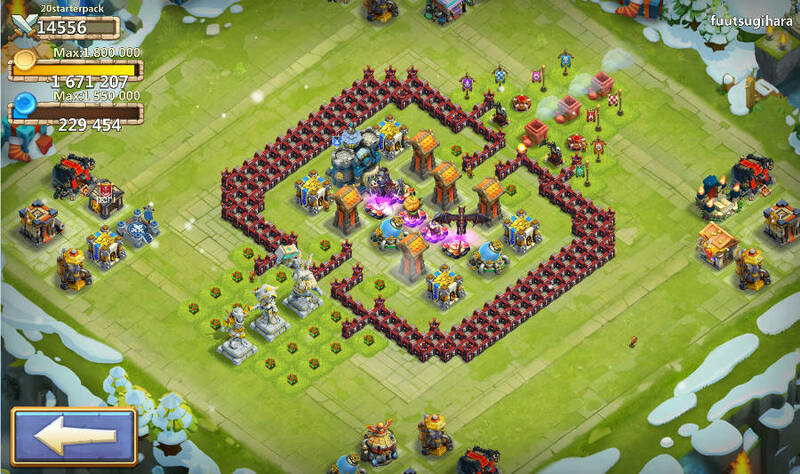 If you get rid of the ground troops quickly B and C is very easy, hence Cannon Towers. HBM B can be started as soon as you have 5 heroes capped at 60. So, usually day 7 or 8 on a F2P account. On a P2P account you can start farming B on Day 3 or 5 depending on how much you spend. This base works with 5 quality Heroes. I've tried many different heroes but found the ones that I listed above give the best success rate. All Heroes must be capped at 60 due to self destruct in every wave. Town Hall 10 is a modified smaller version of a full diamond base. Remove the Gold Vaults from the sides before doing HBM. As they don't have enough hit points and can cause failures. I only place them there to protect my gold when i'm offline. Town Hall 11 is the same base but with added extensions. The added walls cause the wave to run around giving more time for your Heroes to kill the wave. This will give you a 90% success rate as opposed to trying earlier at Town hall 10 and maybe having a 30% success rate. There is a left and right spawning weakness. Both are towards the bottom corner. If the wave spawns there they will attack your bottom corner Hero first. This will most likely cause a failure if it happens twice as you will be down 2 heroes by the time you hit wave 5 or if wave 5 spawns there it will be a failure for sure. Once your Cannons have leveled up a little more it will compensate for this weakness. So your first day at Town hall 11 wil have a 90% success but after a few days it will turn to 100%. Also, if all 5 waves spawn in the bottom area, it will be a failure. Since there is only 1 cannon it'll be destroyed and nothing will be there to aggro wave 5 from your heroes. HBM B can be done with 3 star Heroes. I've tried tons of bases at different levels and found this base to work the best. It also protects your gold well, you just have to rearrange a few walls and move your vaults. I suggest rearranging back for HBM as the Vaults don't have enough hit points and will cause failures. Also the Gold Vault in the middle acts as a dummy target. If a Cannon falls the wave will immediately target the vault before targeting Heroes. Furthermore, you can 2 man - 4 man HBM B with higher level cannons and Heroes. You will get a feel for how strong your Cannons are and what you can handle. HBM B is where your Starting 5 Heroes will mostly be farming. HBM C can be started 3 - 4 days after HBM B, however, I suggest not 4 starring any of your Starting 5 heroes. I would wait and save your Honor Badges for when you buy Thunder God so you can immediately 5 star him once you get him. But, if your making a lot of Honor Badges a day (3000+), you could 4 star your Engineer while you wait for your Thunder God and start doing C with the minimum requirements. In a demonstration video, I start HBM C on day 14 as soon as I bought my Thunder God and 5 Starred him. 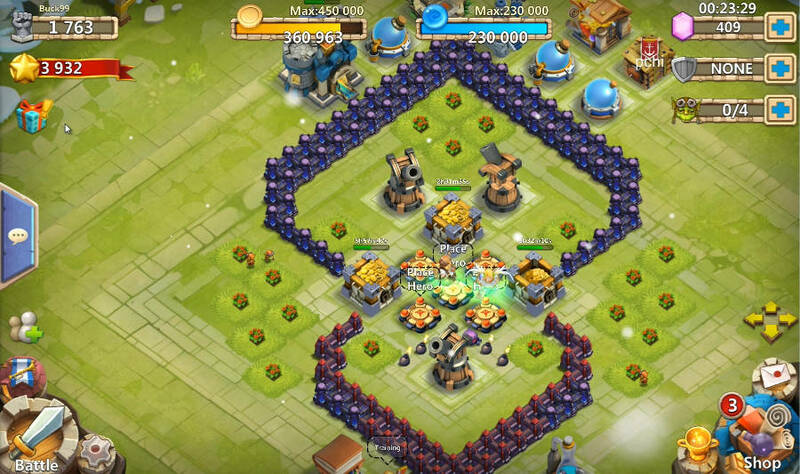 The base is the same as HBM B, just with better Cannons. 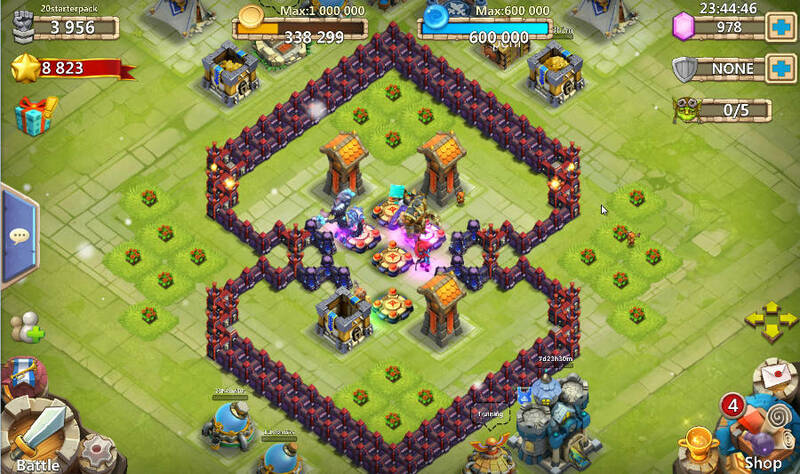 At Town Hall 12 - 13 you can build a better base that will eliminate the spawning weakness of Town Hall 11. The only weakness in this base is the low hit point Gold Vault. But for HBM C its not a concern, maybe if your doing HBM D it could cause problems. You can see the added extentions that make the wave run all the way around to the tower. Also, you've probably noticed the Cannon Towers are now Arrow Towers. 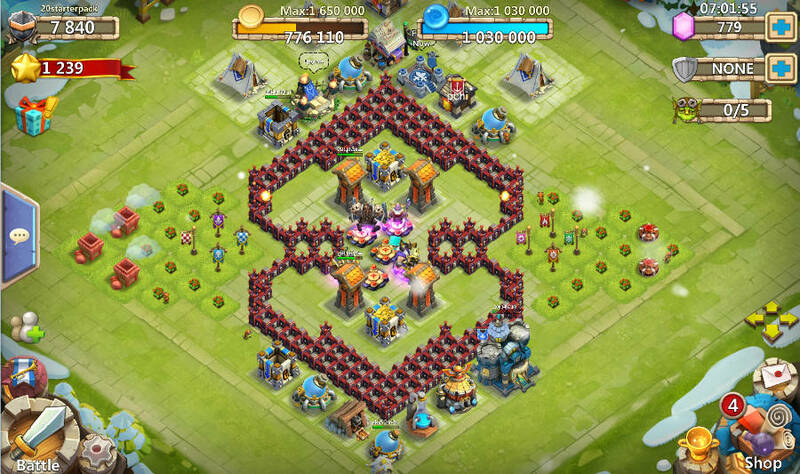 This is the transition period between C and D. As you get ready for HBM D, you want to start converting your Cannons into Arrow Towers. 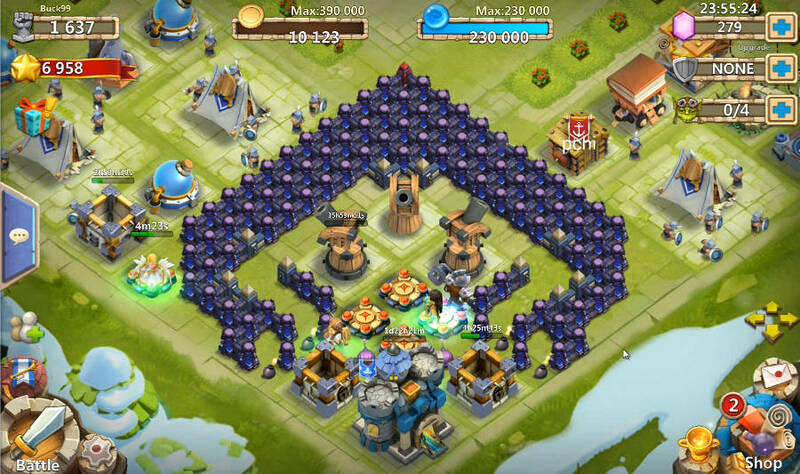 At this Point your Heroes and Towers should be a high enough level to have Arrow Towers instead of Cannon Towers. 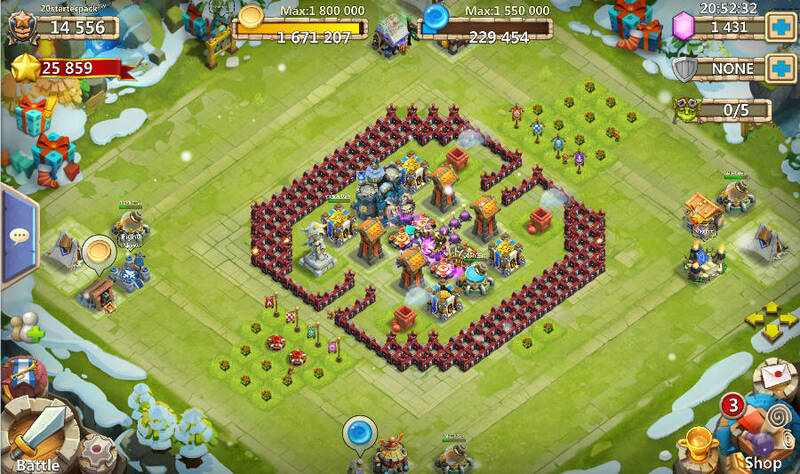 It is also a good idea to keep 1 Cannon Tower if your lacking in AOE heroes. 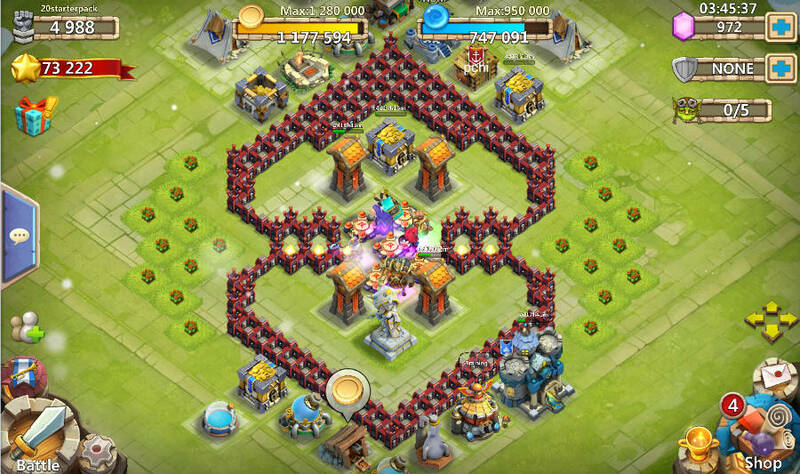 This is the full Diamond Base that will take you all the way through HBM G. It was designed by someone on the Taiwanese server. It's not until HBM H where you have a fundamentally different base, the Box. 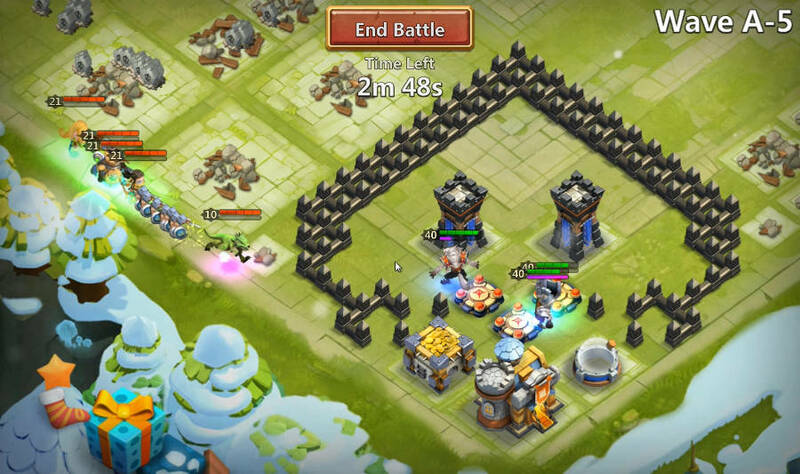 First - your Heroes will target the wave earlier as they run along the wall and will start chasing the wave instead of immediately targeting them as they enter your base. Second - It causes the wave to target your heroes in HBM D+, I'll explain that in the HBM D section. 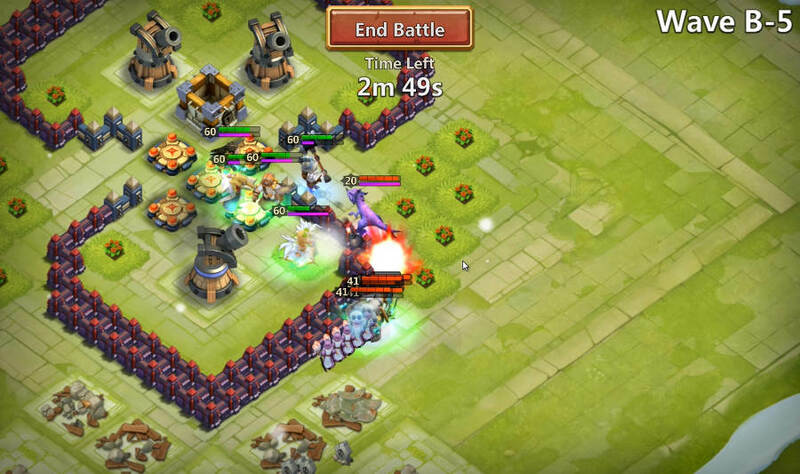 Third - It causes the wave to try and break through your walls due to targeting your hero instead of a tower. As you enter HBM H - J, thats the time to really start pumping up your Hero Bases, but not before that, unless your going with a different base design. The only weakness of this base is that it doesn't protect your Gold, until maybe Town Hall 15 where you can place two Gold Vaults inside your base with the added walls. You will be farming HBM C for a while. You could spend the Honor Badges and level up your common Heroes to do HBM D, but since you will be getting Druid and Special Legendary Card. It's better to save your Honor Badges so you can immediately 4 -5 star them. Furthermore, as your Towers gain levels you can start 3 manning HBM C to give more experience to the Heroes that need it (Druid, Thunder God). Once you get Druid and making enough Honor Badges its also a good time to 4 star Engineer to get ready for HBM D. Only if you haven't gem rolled other Legendaries. If your having problems getting Honor Badges then its better to just stay in HBM C and save your honor badges for Druid, Thunder God, and any other quality Legendary Heroes. HBM D is the hardest transition since you have to wait for some heroes that you can level up. So, with no luck at all with gem rolls you could be doing HBM C for awhile. With really bad luck, you might only have Druid and Thunder God for a while until you get Immortep. Thats if you've had no luck with gem rolls and your Special hero card was a bust. If thats the case then you could start doing HMB D once Druid and Thunder God are 90+, Engineer at level 80, Special Hero Card at level 80 and 1 other Hero at level 60 (3 Star). Anways, HBM D introduces Griffins, hence Arrow Towers. You will most like Farm HBM D until you get Immortep and can start doing HBM E - F.
HBM E is easy once you get over the HBM D hump. It just requires your Heroes to be a higher level. Also, you will most likely have farmed Immortep by now. HBM F is also easy just need higher level Heroes. 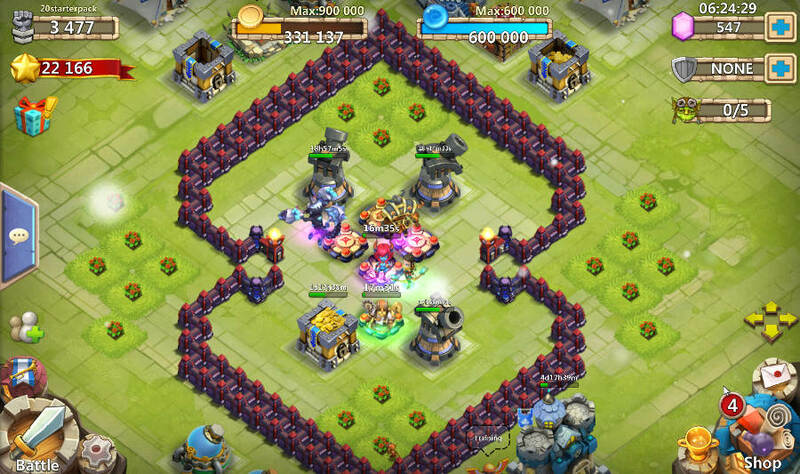 The base is the same as HBM D - F. At this point, you should be doing inscriptions, so find a good combination of Heroes levels and inscription levels that will let you do HBM G.
HBM H requires a new base design. Since HBM H introduces Ornithopters, a tower based design (diamond) does not work. Here we will switch over to the Box design. 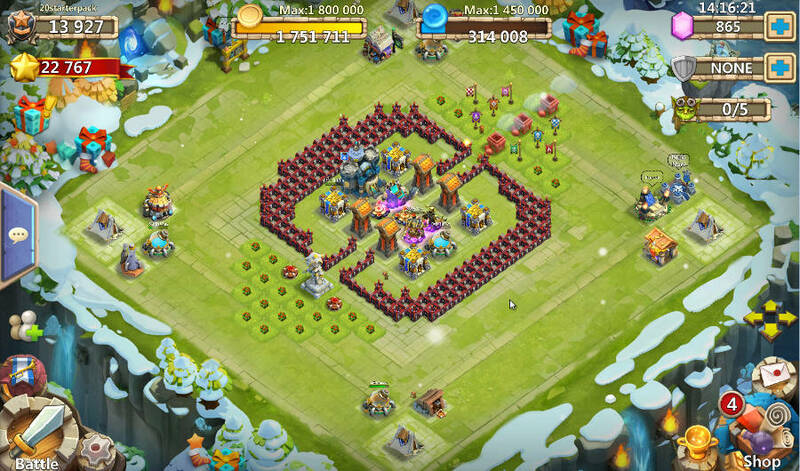 I prefer this base design when my Hero Bases are still Level 8. This design works well when your starting to level up your Hero bases. You can level Hero Bases up to Level 12 before the range exceeds the walls. Your hero bases should be level 13+ for this base to be effective. HBM I can be done once your Heroes are a higher level. It can be done with a Town Hall 16 but Town Hall 17 is much better. Town Hall 17 gives you more walls, an extra Tower, and stronger buildings. Also, for HBM I and J you'll need to use Guardians. 20 seems to be sufficient, but build more if your having issues with Spirit Mage. This is a good HBM to farm for a while. Unless you can farm HBM N with no garrisons, the experience in HBM J is better. I usually wait until HBM O, but HBM N seems to be equal. Same thing, this is just a guess. It all depends on what Heroes you've rolled up this point. You could be doing HBM J sooner or later. Wait, why keep your might low? Sorry this Guide is a work in progress. I thought save meant save, not submit. Can I join your guild pchi? I really like what you have done and.also I try to do.the same but it.does not.work for me. Champ is such a boss buster and works so well with TG that I'd say he's the second buy. Also be on the lookout for zerk 4 or 5 (from TR quest) and slap that on your druid for the ATK bonus overlap. Also I'm trying the 10k plateau, where I consume excess heroes to keep my might between 10 and 11k. Why would you keep might at 11k? Raids, counterraids, HE. This is a wimpy hero route.